When you purchase a subscription with Scanova, auto-renewal is kept active by default. This is done so that your account and dynamic QR Codes can remain active and your end-users (who scan the QR Code) are not affected. However, at the time of purchase you are given the option to cancel auto-renewal. You can also cancel auto-renewal anytime via your account settings. However, we understand that sometimes there can be a delay in cancelling auto-renewal. In this case, you will automatically be charged. An email notification is sent to you whenever a recurring payment is made to renew your account. 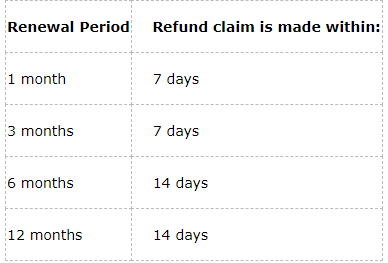 The refund will be made within 24 hours and your will receive the amount within 7-10 working days. It is possible that you may wish to upgrade to a higher plan (Lite to Standard, Lite to Pro, Standard to Pro) in between your existing subscription period. In this case, we will calculate the remaining amount you are eligible for and offer a discount coupon of that amount. You can use this coupon to deduct the amount from the new purchase (upgradation) you are making. Alternatively, we can also extend the validity of your new subscription plan by a time period equivalent to the refund amount you are eligible for. Note that the refund amount will be calculated on a pro-rata basis. To exercise this option, please reach out to support@scanova.io. It is possible that you face technical issues with Scanova that hampers your QR Code campaigns. In such cases, reach out to our technical team at eric.vu@scanova.io and we will try our best to resolve the issues as soon as possible. However, in the event that the issue is not resolved in a timely manner and your QR Code campaigns are affected as a result, you can demand a refund. Such cases will be dealt by the executive team and a decision will be made on a case-to-case basis.